Believe it or not, but, if you haven’t known yet, these manufacturers are both multinational companies originated in Japan. Yes, Olympus and Sony were first founded in Tokyo, Japan, several decades ago. Today, their mirrorless digital camera models are competing in the global market, each favored by a lot of people. 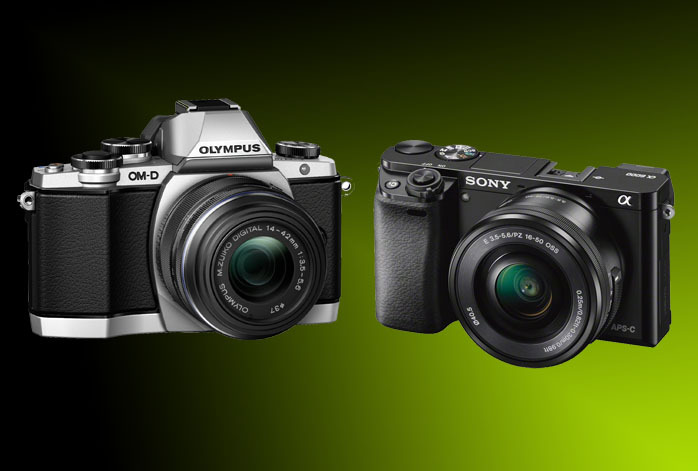 On this chance, we are going to compare Olympus OM-D E-M10 and Sony a6000. The latter model is often considered as an excellent value product, while the first one is favored by many for the neat looks and built-in image stabilization. As both models are available around five hundred bucks, which one should you choose? Olympus OM-D E-M10 comes with built-in image stabilization feature that can enhance the sharpness of your pictures and videos even though your hands are trembling during the shooting and recording. Olympus OM-D E-M10 also has a touchscreen control, as opposed to Sony a6000’s dial controls. Though a touchscreen appears cooler, dial controls are often more favorable because they are easier to access and quicker to use. Nonetheless, if we now talk about performance and output quality, Sony a6000 is certainly the winner. To begin with, Sony a6000 is armed with a 24MP APS-C CMOS, which is certainly more superior than Olympus OM-D E-M10’s 16MP image sensor. Enhanced even further by having 179 focus points, Sony a6000 is able to generate larger yet sharp and detailed images than Olympus OM-D E-M10. The colors and shadows are also significantly better because it has higher color depth and dynamic range. Sony a6000 is also more reliable for long sessions. Not only it has a very small shutter lag time, but it also offers a big buffer capacity, allowing it to snap more pics than Olympus OM-D E-M10 before taking a break. Last but not least, Sony a6000 has a powerful edge for continuous shooting, offering a whopping photo burst of 11 fps, which shines over Olympus OM-D E-M10’s 8 fps continuous shooting speed. As the conclusion, Sony a6000 has more beneficial advantages than Olympus OM-D E-M10. Offering much higher performance and better output quality, Sony a6000 should be the way to go!